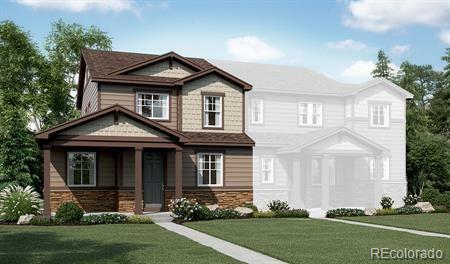 A beautiful Niles plan located in Serenity Ridge! Inside you will find 8 foot doors throughout, a contemporary fireplace in the great room, a covered patio on the front and side of the home, and a kitchen fit for entertaining with a gourmet kitchen layout. Outdoor features include fencing surrounding the home, a side yard and covered patio, landscaping, and a park right outside your door! Community amenities include several trails and parks including playgrounds. Conveniently located to a large King Soopers within walking distance, Southlands mall about 3 miles down the road, and approximately a 30 minute drive to DIA. This home is under construction and will be available January 2019! Ask about our special offers.